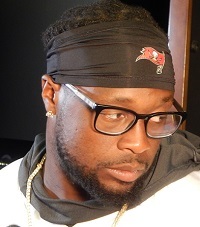 After breakfast with Bruce Arians today, Joe wouldn’t bet a dollar that Gerald McCoy plays for the Buccaneers this season. Arians is known for not spewing a pile of BS, so it’s quite noteworthy that on March 26, he doesn’t know if McCoy is good enough to play on his football team at his $13 million salary for 2019. Arians made that very clear. Joe continues to smell a draft day trade and the Bucs drafting a defensive tackle at No. 5 overall. Joe wrote last week that the Bucs were leaning that way and this is simply more evidence. I’m just trying to figure out who u want at #5 if Williams isn’t there. Ed Oliver? At #5? Could be solid but I’d rather trade down. Give me sweat, white, bush first though. I know Oliver isn’t getting nearly as much love as Williams, but he appears to be a legit game wrecker. Jason needs to dump Mcsoftserve and his bloated salary to find some way to get Oliver to Tampa. Best case scenario, dump 93, find a trade for the 5th pick, slip a few places score #10 and an extra pick or two. Always thought the Bucs could get a decent pick for him, but now I just want to see him gone. Cut if they must. Guess his game tape is showing up with the new staff. SOFT as melted ice cream…. I am not sure if a team is willing to be saddled with his enormous contract. He has always been elite at getting penetration into the backfield. His problem is he does not have good instincts for the position. It is not uncommon for McCoy to whip the guard in front of him, but the running back still runs right past him. Neither nutter we’re running 3/4 next season and already have a nose tackle that perfectly fits. Sure you know the measurables 6’5 346lbs. Think he goes by Vea. Phsst😊SMH man. The money is the biggest issue,scheme for which isn’t is next biggest issue. Writing is on the wall…really like the candor Arians has…. Wow, that is quite the comments about McCoy. Simply put, a “good player” that is 30 and up shouldn’t be paid $13 million a year. This is actually the biggest and best news so far thus off season. For crying out loud this cried on the sideline,looking for hugs and [email protected]$: from teammates. He must go. Oh happy days are here again😁😁😁. I love my new coach! No none since,ain’t holding nobody hands round here. Show up give yo all or get the f([email protected] on. McCoy is still with the Bucs as trade bait during the draft or post draft. If he is not traded by then, the Bucs will run out of money to sign the rookies and will no doubt release him. OMG this just made my workday.. Thank yooouuu Joe. We could pick a DT @ 5…..or even in a trade down situation….but that is not a certainty. My thing is Vea was a bad pick if his ceiling is simply a space eater. Dude needs to lose a bit of weight this off-season and move to 3 tech and draft a mid round space eater. If they are smart they trade McCoy because it’s just time. Wow he truly is as straight-forward as we thought. Really refreshing. Cool as hell. I feel like the team is definitely in good hands with B.A. LOL, Now the sheep want to trade gmc!!!!!!!!!!!!!!! Its a year too late sheep!!!!!!!!!!!! Huge draft for defensive line, which means that there will be a huge glut of old defensive cuts!!!!!!!!! no value at this time for GMC!!!!!!!!!!!!!!!!!! Its a shame that the higher ups forced the dc to run a scheme around gmc and build around him, because he shuts down if the scheme does not fit gmc!!!!!!!!! But we told the sheep this over a year ago!!!!!!!!!!!!!!!!!!! LOL!!!!!!!!!!!!!!!! 2019 will reveal answers to the sheep, that the real fans already know!!!!!!!!!!!!!!!!!!!!!! SMH! Some of you missed your calling! If GMC is playing somewhere else, it will be strictly a business decision. Who will be the next scapegoat I wonder?! Probably Ali Marpet since he has so much effect on the outcome of a game! Oh, that, and he doesn’t elevate the play of the players around him! I got Macdaddy stayin here this year. I wonder if Vea stayed in Florida for the off season, gotta stay year round for a couple a years to get acclimated. Or just be a November- December warrior again. Vea still has a ton to prove. are you wearing your Superman or Batman PJ’s today…. Most everyone here called for McCoy to be traded last year. I can go find a sh1t ton of people saying that including myself. But continue on dude. You are a great fan and super respectful of everyone here. Vote NO on Ed Oliver. Thank God. This guy has been cashing stolen checks from Glazer for too long. jmark, what are your credentials to make that opinion of vea? Are you a scout? do you work at one buc? You sound like some guy with a big mouth and no real understanding of the game. Well I mean Joe is advocating for a dt. I don’t want one and I’d bet a lot we don’t take one, it was more directed towards his thoughts. I don’t care who got turned off by his response. Devin white is a solid pick. But I’m leaning towards bush as of lately. Wouldn’t be surprised if we traded mccoy to move up to 3 and get Williams or Allen. Lived in Florida most of my 54 years…been a Bucs fan and attending games since they started, and I have two eyes. That’s about all it takes to back up my otherwise innocuous comment about Vea. Vea hasn’t shown yet what he can be. Everybody knows that. It’s a fair statement. Kyle…. YOU TELL EM BRO!!!! Poor GMC has suffered SO much here in Tampa! He has suffered 100 million times more than most of these yahoos calling him out! I’m with ya Bro! Buccernutter, you’d have to give McCoy, your first and probably a 3rd or 4th to move up even a spot. McCoy has zero value with his contract. Ohhh…is @Joe “continuing to smell a draft day trade” with GMC??? Cause some of US on here said long long long ago, long before “last week”, or the league meetings, that likely GMC would be dealt in the draft. Funny. Joe you reminds of someone with a laser pointer bouncing it all around to drive a bunch of kittens into a frenzy. And today’s laser point is … tada … BA won’t commit to GMC. Let’s see, BA won’t commit to a 30-year old DT whose production is declining and who’s making $13 mil that we desperately need. Yup, bounce that off the wall again and watch the kittens go berserk. This sure is a silly time of year. I agree with Realist, it’s a year too late. If you were another GM, would you pick up GMC’s $13 mil a year for 3 years contract? Because that’s what you’d have to commit to in a trade, unless GMC agrees to restructure for less $$$/fewer years. And if you release him outright, you’d have to spend one of your Top Round picks to replace him … with a rookie to pair with Vea (another almost rookie). But that’s OK, because they’d be backed up by near-rookies in the LB corps & Secondary. Yup, that’s surely a formula for success. Wonder why Licht didn’t think of that earlier. I said it before, he’s only on the team right now because the draft hasn’t happened yet and he doesn’t cost anything right now. He’s gone, he knows he’s gone, it’s just a matter of time. Problem with McIceCream is he has no heart! He’ll be fine in OTAs but come 4th quarter of that game where we’re up 5 and need a goal line stand he’ll disappear as always. If I were the Colts I would. They have TOO much $$ right now. This type of signing is perfect for them because it’s temporary and during a time where they have an insane amount of cap room and many have them projected as SB favorites next year. For McCoy he could restructure to take a signing bonus restructure / front load his contract so that it benefits him and the Colts who can try to win a SB with him next 2 years and then dump him if they want without much financial penalty. The colts have 2 4ths and 2 2nds this year. Please evaluate GMC right out the door. Good riddance! …and McCoy’s perfect replacement? Wilkins, out of Clemson. Why? He likes dressing up in Power Ranger outfits…seriously! Why would the Colts do that, when they could just use one of those second round picks and get a better DT for a fraction of the cost!!!!!!!!!!!!!!! 2019 season will reveal answers to the sheep, That the “real” fans already know!!!!!!!!!!!!!!! SCH- Can you get me those lotto numbers for next month?! They very easily could do both. I doubt they’d give a 2 for McCoy but maybe a 4. Should have traded him last year like most the “sheep” here were actually saying.. They have $75 mill in cap space even with Andrew Luck carrying a $28 m cap. I duno why they were so silent in FA. They could do a deal where they don’t give up much draft capital for a proven vet and it would have no impact on their ability to sign sh1t loads of FAs the next 2 years if they wanted. Why would you say something like that if you wanted to trade him??? That just seems stupid to me. I think they will try to restructure his deal and keep him at least for this coming season. Guy pulled a little less than half a million dollars PER tackle last year–GTFOH!!! Total restructure set up. If you are paid that kind of money at that position, no way you should have to watch film to determine if he was good or not. He should just jump off the page. No way they pay him $13 M this year. He is either traded, restructured or cut. Mark it down. Restructure to 3 mil with massive incentives, say $300 K per sack? He could still get his 13 plus we would have a double digit sack artist, Win-Win! BTW, anyone thought about what the D-line would be without GMC last year? For instance, does JPP get double-digit sacks playing next to Beau Allen, or Vinny Curry, or Will Gholston of all people? No, he’s not the DT he once was. He’s still valuable……somehow! Why would you say something like that if you wanted to trade him??? let him go big guy….. let him go…. 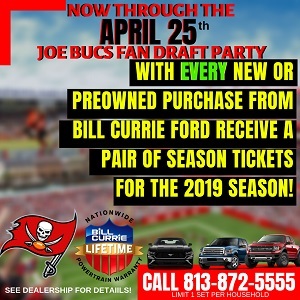 with or without cancer93 the bucs have been embarrassing for nearly two decades… let’s ask the real question, think about how nice it would have been if they would not have drafted the clown in the first place! maybe the last decade would have produced a SINGLE MEANINGFUL WIN!!!! We already know beyond a shadow of a doubt they can lose with her. Enough with the restructure crap. Y’all either don’t know how restructures work or are extremely dense. Read the article for crying out loud. It barely sounds like they even want McCoy for this year. Why in the world do you think they will restructure him and guarantee him multiple years? Put down the crack pipe SteelStudBuc! Trade him for what he is worth….. Either a undrafted rookie or a 7th round pick in the supplemental draft. Looks like they are waiting to squeeze him to restructure his contact IMO. He knows if all the big FAs get signed now, very few teams will have an extra $13M lying around to pay him his current salary. He might as well take the cram down and stay in Tampa at that point. My question is this, I’ve been reading article after article on this site about how McCoy is an All-Pro caliber player, and he’s one of the top DT’s in the NFL… why is it then that no other team thinks he’s worth the $13 million. I mean, someone will sign him when he gets released and he wont get close to that money, but many of us of sane mind and spirit have been calling for his a$$ to move on for years, that his presence has been holding back the team, yet no other team wants him at his current salary? What gives? Either we were right and he isn’t what everybody says he is, or…………..some of us are right, he isnt what everybody says he is. He’s a middle of the road stiff who manages to guess the right snap count once or twice a game and then tries to arm tackle and misses. Yo I bet any amount of money we trade big softy to the big apple! @GotBucs…. that sir is the BEST description I have EVER ahead of Batman! Great job sir! Guess Joe doesn’t like me calling him out…. he puts my comments in moderation. Can you say sensorship? Yup censorship is alive and well! Don’t you dare talk about GMC!! I have to agree with Joe on this one. If Q falls to 5 he will be our pick, if not then either we trade down and take Oliver or stay at 5 and still take Oliver. He has the potential to be the closest thing to Aaron Donald, no one is or will be as good as AD, but Ed can ball. The only other player I think we would consider at 5 is Allen and I think he will be gone before #5. This next month can’t get over soon enough. GO BUCS!! tmax- I can’t help it dude. I live and breathe Buc football. I get your point but in your heart of hearts,you KNOW I’m right. The good news is that we will have to different discussions once he’s gone. In fact, I’m having my lawyer draft some papers for you to sign regarding catch phrases you will no longer be able to use due to the “excessive use” clause!!! LOL! Is BA ready to get rid of McCoy or trying to make Gerald prove him wrong? BA, master motivator?